Happy Kitchen Sink Stamps Monday, thanks for stopping by today, I hope you had a great weekend! Hope you have something cool planned for this week, as most of the US is going to be exceptionally hot! When I was creating samples using the new July Releases, I immediately thought the smallest basket from the Multi Step Basket set would be wonderful for a single flower. I struggle with Sympathy cards (as we all do) and was really hoping I still had some on hand, but unfortunately I didn't. I thought this CAS card using the Multi Step Basket and Multi Step Sunflower would be just perfect for friends of ours. Have a creative week, I off to Summer CHA today to take a few classes! Wonderful card, luv the colors! Beautiful work with this sweet sunflower in your basket, Lisa!! 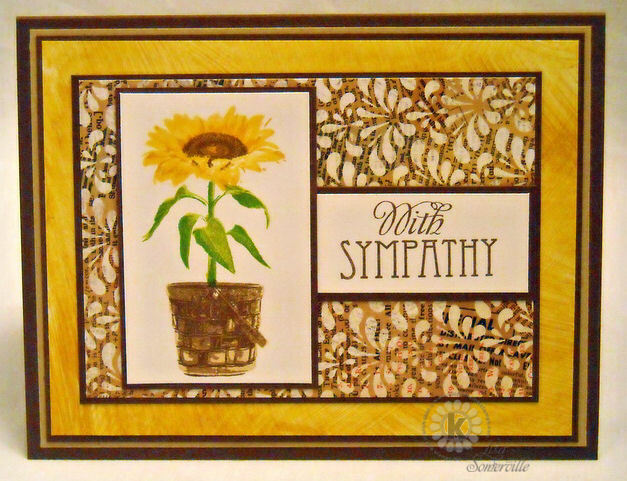 Great layout and pretty papers for this card of sympathy. love this card, that paper with the sunflower image and the layout is gorgeous. Oh Lisa! Your sunflower in the basket is just PEFECT!! Love it! Can't wait to use the basket more myself! Hugs! What a beautiful sympathy card Lisa. It's so warm and simple...the best way to show you care. The background paper looks as if it was designed just for the basket and sunflower! Beautiful card! Stay cool! Pretty sympathy card Lisa! I love the use of the basket with the sunflower. Wonderful background too.